This device is suitable for use in an industrial environment when installed in accordance to these instructions. It can be mounted vertically or horizontally. You should provide min. 50 mm (approx. 2 inches) of space on all sides of the device for adequate ventilation. Keep in mind to maintain spacing from enclosing walls, wire ways, adjacent equipment, etc. The device can be mounted to EN50022-35×7.5 or EN50022-35×15 DIN rails. There is no need for using any screwdrivers or tools. 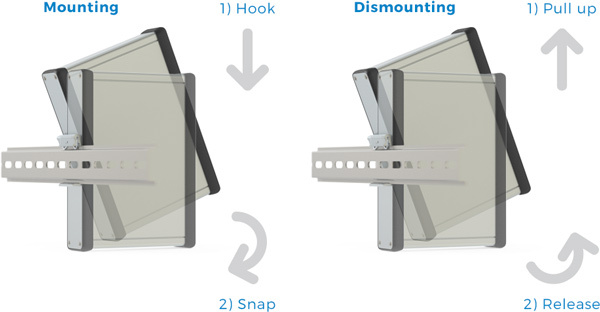 Simply hook the top slot over the DIN rail and then, while pressing the device down against the top of the rail, snap the bottom of the device into position. To remove your controller from the DIN rail press the bottom jutting part of the holder (you may need a screw driver to do so) and release the device from the DIN rail by carefully pulling it up and towards you.